Mister's father passed away on March 23rd, and last weekend we had the funeral ceremonies. They were held according to the shinto tradition. While many (if not most) Japanese funerals follow the Buddhist way, the Ikedas tend to stick to shinto. Why? This family's custom, I suppose. I wasn't planning on writing about it on here, but a couple of my curious readers convinced me it might be worth it. It's not something that many people know about. And that's true. Until last week, I had no idea what a funeral in Japan might look like and what's expected of surviving family members. So, I will write about it. If you do not wish to hear about losing a loved one in Japan, please stop reading now. Instead, why don't you visit some of the excellent blogs listed under the Japan Blogroll header? For the rest of you, this is how it went. When Father passed away and doctors disconnected the machines from his body, we were asked to leave the room. A team of nurses dressed in plastic protective gear - gloves, coats, etc showed up. They brought with them an electric shaver and make up, and asked us what kind of clothes we wanted them to put on Father. I felt sorry for them, because never before have I seen nurses preparing the deceased like that. As far as I know, in western countries, the body is taken to the morgue without any make up or hair dressing. While the nurses were preparing the body, we informed the doctors which funeral home we wanted them to contact. They called the place to send a hearse. By then it was already after midnight. When the nurses got done with the make up and dressing, it was time for a "farewell ceremony". As we had said our goodbyes to Father when he was still alive and conscious, we declined to participate in this performance. Needless to say, that didn't go over too well with the other people there. We drove to the funeral home, and when we got there, we waited for the body to be displayed. We lit incense sticks and made noise using a singing bowl (rin?). After that Mother and a guy from the funeral home sat down and planned the funeral ceremonies. The funeral itself had two parts. The first part - otsuya was held on Saturday. The cremation took place on Sunday. The ceremony room was decorated with flowers - white, yellow, blue and purple. A shinto altar with wooden trays (sanbo), on which offerings of fruit, fish, rice and sake were presented, was set up displaying a large back-lit portrait of Father. 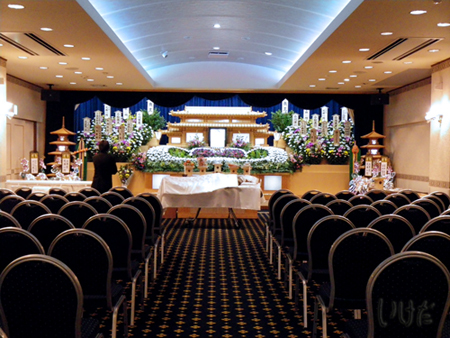 The casket was white and decorated with a rope (shimenawa) with white pieces of paper (shide) hanging on it. It was positioned east-west, with the head towards the east, and feet pointing to the west. The first part of the ceremony was for family members only. We gathered around the body and honored the deceased the shinto way - two bows, and two silent claps (we didn't actually clap like you'd do it at a shrine, here no noise was allowed), and then one more bow. Then we were given pieces of wet tissue to ritually clean the body. We just rubbed it on Father's hands and face. After that, everyone came up to the body and said something to Father. Some said it out loud, and some whispered in private. Then the men lifted the body and placed it in the casket. The second part of the ceremony was open to anyone. Everyone was dressed in formal mourning clothes - pitch black suits with white shirts and black ties for men, and black dresses with jackets for women. The rules regarding funeral attire are very rigid and you can't just wear any black clothes you happen to have in your closet. You'll look stupid and out of place. Ladies can wear kimono, plain, with no patterns, either dark gray or light purple. Black kimonos seem reserved for immediate family members. School age kids wear their school uniform. When the guests arrived, first they deposited their envelopes with money (koden) at the reception desk. In return, they got a bag with a souvenir. Not sure what it was, something that Mother selected from the funeral home's catalog. The bag was black with the funeral home's logo on it. Then the guests proceeded to the ceremony room for the memorial service. The shinto priest conducting the ceremony wore purple robes, black lacquered wooden shoes (asagutsu) and a ritual black hat. He was introduced as belonging to Takafuji shrine. The priest started with the oharai (waving a branch with shide) ritual to purify the room. There was a lot of praying, chanting and bowing. He instructed us when to stand up, when to sit down and when to bow. After he did his bit, we all lined up to offer tamagushi (branches with shide attached to them) to Father. The immediate family went first. Then we stood to the side and as other people offered tamagushi, when they finished, they bowed in our direction and we bowed back to them. After that, Mother gave a speech, and then the eldest son (Mister) spoke. After that, we (the immediate family) left the room and positioned ourselves by the exit. There, we said thank yous, one by one, to everyone as they were leaving the room. This was the public part of the ceremony. After that, the family and relatives got together for dinner. The casket with the body was moved to the room where the meal was served. 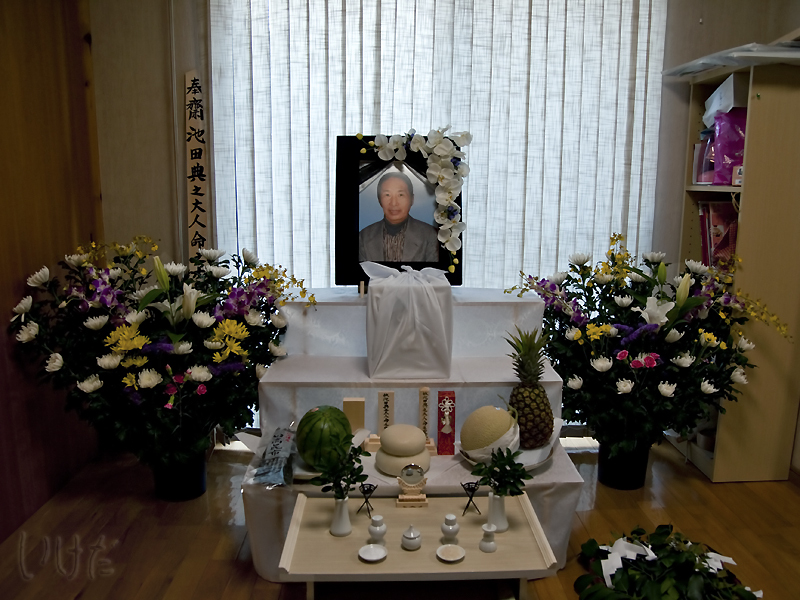 In front of the casket, two small dishes with rice (uncooked) were placed. When you came up to the casket, you said your hellos to Father and you moved a grain or two from one dish to the other. A place setting and food was also prepared and positioned next to the casket for Father. Dinner started with a toast - a spoonful of sake in a tiny cup. After that, the immediate family, instead of eating, grabbed bottles of drinks and ran around pouring juice, beer and what not. It would be rude for guests to pour their own drinks and it was the immediate family's responsibility to make sure that everyone was chatted to, acknowledged and that the guests' glasses stayed filled up. When the guests left, after saying goodbye to Father, of course, the servers cleared the dishes, and we moved to a guest room right next door and read condolences from those who couldn't attend the ceremony. The casket with the body stayed in the same spot for the night. The funeral home can provide accommodation for those family members who come from far away, or who don't want to go home for the night. The accommodation was a two room suite, with a kitchenette and a full bathroom. Mother, brother in law and his wife stayed there and Mister and I returned home. The next day we went to the funeral home early and had breakfast there. When arriving, we had to say hello to Father and move grains of rice from one dish to the other. Being the eldest son's wife, I had to wear a plain black kimono that day. Younger son's wife was lucky and could keep her own clothes. But Mother and I had to be decked out in traditional garb. The casket was moved once again to the main ceremony room. More guests came, the same shinto priest appeared and we did more chanting, bowing, and purifying. It proceeded just like the day before - after tamagushi offerings, we stood to the side and bowed to others as they bowed to us. However, this time, when we were done, we placed flowers inside the casket. Then the casket was closed. After that we were handed items from the altar - I carried a tray of rice, sake and a glass, Mister carried Father's portrait, brother in law - the urn in which Father's ashes were going to be deposited, Father's brother - the sotoba (grave marker), and Mother - the spirit tablets (ihai). We all went downstairs and everybody else followed us and bowed to us. The casket was put in a car and we all went to the crematorium. The guests followed in a rented minibus, or in their own cars. At the crematorium, the casket was loaded onto a high-tech cart with a computer screen displaying the name of the deceased. Mother was asked to verify the name and then we followed the cart to its final destination. We carried the items from the funeral home, and as we went by, people bowed and waited for us to pass. The priest was waiting for us in the last room. We set up the altar again (that's why we were carrying all this stuff) and offered tamagushi one more time. Then the door opened and the cart deposited the casket there. The door closed. We were asked to go upstairs to have sandwiches and coffee while we waited for the ashes. It took about 40 minutes. We were called to return downstairs and there, on a marble table, was a pile of bones. The head was separated in the corner. We were all handed chopsticks and two people at a time would pick up a bone with their chopsticks and place it in the urn. This was repeated until only the head was left. The guy overseeing the process crushed the bones in the urn and made space for the head. He showed us the teeth and other features. Then he closed the urn and wrapped it in a white sheet. We formed our procession again, except that this time brother in law was carrying the urn with ashes, and we returned to the funeral home. There, the urn and Father's photo were placed in the dining room and we had a meal. Again, a place setting and food was set next to the urn with ashes - for Father. Again, the immediate family was running around serving drinks. When everyone was fed and ready to go home, the immediate family lined up by the door and thanked everyone, one by one, for coming. When everybody left, I could finally take off the kimono and wear civilian clothes. Then we took the ashes and went home. Two ladies from the funeral home came with us and set up a home shrine for Father. We had to clear a room downstairs, because there was no other suitable space available, as the altar had to face south. After 50 days (49 if done the Buddhist way) we will hold another ceremony and either transfer Father's ashes to a cemetery (if a space was booked and paid for - that can be quite difficult as there aren't enough shinto cemeteries around), or we'll continue keeping them at home.